I'd like to tell you a little about myself so that you know the source from whence the trivia is coming. The Vancouver area (Lower Mainland) has been my lifelong location (born, raised and worked here for the past 54 years). I currently reside in Port Moody with my life partner, Linda. Ive seen a lot of change in the area, all of it related to population increase. Streams I used to fish as a kid are either gone, changed or crowded with people . The commute to work used to be fifteen minutes. Its now half an hour on a good day. Bad days are committed to memory delete, and I fill those spaces with day dreams about fishing. My lifelong passion for flyfishing began about age 14. This passion was strongly influenced by PGE rail trips to the bountiful upper Cheakamus River for rainbow trout. There was hiking/fishing trips in the Rockies , where trout were elusive and challenging. These excursions in the scenic mountains suggested there was much more to successful angling than catching fish . I did start with bobber and worm. However, almost immediately this was replaced with flyrod and fly after being influenced by expert flyfishers on the Cheakamus, and being the fortunate recipient of a mint cane fly rod, and all the gear. Perhaps my angling education has been narrowed in scope by this early specialization. Sometimes I feel guilty about it - mostly I dont. The beauty and technique of casting a fly has always fascinated me. Recently, I have spent more time studying casting techniques and the art of teaching fly casting. I am a certified casting instructor under the Federation of Flyfishers "Fly Casting Instructor Certification Program". I do not feel qualified as an "expert" in the world of angling and would rather be considered as a "dabbler" in most aspects of flyfishing. Ive fished in a lot of different areas for a lot of different species with a lot of different fly gear. I tie very mediocre flies (which seem to be getting shabbier as my patience ages), and I cast a single handed rod reasonably well, but am only starting to get the hang of this two handed stuff. In 1968, I was one of a small group of keeners who started the Osprey Fly Fishers of BC .This is the second oldest fly fishing club in the province. Ive weathered and enjoyed the ups and downs of this groups dynamics to this day. 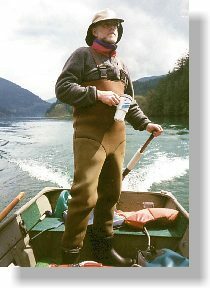 For the past 29 years, I have worked as a provincial government fisheries biologist in the Lower Mainland Region, mainly concentrating on the management of steelhead and other sea-run trout and char. These days, many different interests compete to make fisheries management both frustrating and challenging. It may be presumptuous in my thinking, but I feel that the job, and my interests in angling, give me a rather unique, and hopefully, useful ability to interpret things of importance to anglers. My writing experience is not varied or extensive in any formal or professional sense. For 24 years (until 1996) I was the editor of the "Osprey News", the official paper of the Osprey Fly Fishers of BC. In 1986 I was a chapter contributor in the Canadian best selling angling book "The Gilly" (edited by Alf Davy). Remarkably, this book survives today in its ninth printing, having raised almost $100,000 for conservation as part of the BC Federation of Flyfishers "Gilly Fund". In my writing and photography for BC Adventure, I hope you will allow me to dabble in a variety of topic areas including innovative gear and methods; the aesthetics of the angling experience; the future of angling; being neighbourly on the water; fish and fly casting. What I will try my darndest not to do, in this age of instant communication and growing angler population, is direct a lot of anglers to sensitive fisheries, with small wild fish populations and very little angler elbow room. So forget the "secret spot" stuff from me. I will welcome and appreciate feedback from anyone in computerland who wants to comment.